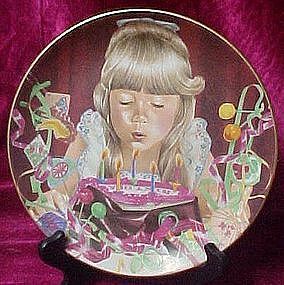 Limited edition plate titled "Birthday Wish" from artist Liz Moyes and the Danbury Mint. Plate made of fine Bavarian porcelain from the series, "magic moments of childhood". Plate is in perfect condition and measures 8 1/4" in diameter and has a nice gold edge trim. Sorry... no box or certificate. I have several from this series.